It’s Sunday morning, and time for some football... but 1) you’re tired of listening to Troy Aikman and Joe Buck use their words to gently make love to Tony Romo and the Cowboys every week, 2) you don’t have NFL Sunday Ticket, and 3) you’re hungry. 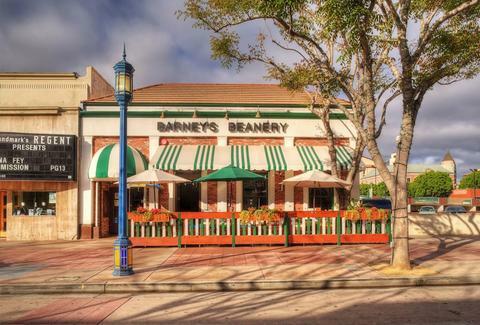 There's now a 94.3% chance you're heading over to Barney’s Beanery and a 5.7% chance you're going to put on pants and then head over to Barney's Beanery, where you can spend the next 6 1/2 hours being reminded of just how much you hate your fantasy football team. Sadly, a lot of terrible, terrible other people are going to be doing the exact same thing. These are the five worst: 1. Guy that needs to STFU This is the fan who pounds his chest, screams like a 10yr-old girl that just found out she won first-place in a screaming contest (and the prize was a pink bow!! ), and does the full first-down signal every time his team earns a first-down. Or gets a tackle. Or successfully snaps the ball. After a quarter or two, you’ll probably figure out who this person is and learn to tune him out punch him. 2. Guy who orders a Diet Coke, gets it refilled 15 more times, and doesn’t order anything else... ever He keeps telling the waitress he’s going to order lunch later. He won’t, though. You’ll admire Diet Coke Guy a little because, well, he's a genius, but also start to hate Diet Coke Guy because, well, he's sitting in a comfortable seat at the center of the bar with dozens of TV screens spread out before him, getting a front row-view of one Papa John’s commercial after another while you wander seat-less from section to section trying to decide whether or not to ask the guy with the Richie Incognito jersey if you can share a table with him. 3. Guy who really should be calling that 1-800 number on the warning pamphlets you sometimes find in Las Vegas casinos There are a lot of nervous people at Barney’s on Sundays. Watching sports can do that to people, because nobody’s more nervous than the gambler. You’ll recognize him by the fact that he’s pacing around while watching the final minutes of the Jaguars game. You’re hoping for a few garbage-time yards out of your flex Cecil Shorts; he’s thinking if the Jags don’t somehow score a field goal and pull through within the two-touchdown spread, he’s going to have to ask someone to pay for his Diet Coke. Don’t ever, ever make eye contact with this guy. If you look nice, he might end up asking you. 4. Cell phone-lover guy It’s one thing to have your head buried in your phone, checking Facebook to see if anyone liked your “Like this if you would be sad if I died” status. But to spend your football Sunday watching your cell phone? C'mon, man. 5. Guy who doesn’t understand the concept of instant replays You know the Calvin Johnson touchdown catch that had everyone in the bar losing their minds a minute ago? The one where he caught a baby with his left hand while catching the football with his right? Every other TV broadcast is going to show a replay of the big moment. Someone who doesn’t understand how replays work will start going apesh*t thinking Megatron got another baby touchdown. He didn't.